Modern Thai is a member of the Tai group of the Tai-Kadai language family. This language family originates from Southern Chinese territory where the ethnic group of the Thai people is believed to have developed before migrating to modern Thai territory. Historically, Thai is linked to Sino-Tibetan languages and vaguely related to Chinese and Khmer. In many aspects, both script and spoken language, Thai corresponds to Lao language, which is closely related to the dialect spoken in Thailand’s north-eastern region of Isaan but has developed a slightly different, simplified alphabet that has adjusted the official script to spoken language. Aside from many references to the ancient Indian languages of Sanskrit and Pali, modern Thai has also been heavily influenced by English language; e.g. check bin, tow-wer, bia (“beer”) etc. Except for words of foreign origin, most Thai words are mono-syllabic and consist of just one syllable. Only a few exceptions consist of two syllables (compound words). Combinations of mono-syllables can, however, specify the word class and meaning of a word. For example, the verb rak on its own means “to love”. Kwaam rak (with kwaam indicating a certain group of nouns) has the meaning “love” (noun). The most complicated feature of Thai language – for Western learners – is arguably its phonology and unique tonal system that doesn’t exist in most Western languages. In English, for example, you can pronounce a word with as many different intonations as you like without modifying its fundamental meaning. But in Thai, a specific intonation of a word has the function of specifying a completely new meaning. There are five different tones in Thai – standard tone, deep tone, falling tone, rising tone and high tone – and four signs in the alphabet that indicate the intonation of a word. That means that two seemingly similar words, or that may sound the same for Western learners, can have two completely different meanings – simply depending on their respective intonation. One famous example is the syllable mai which can have such diverse meanings as “new”, “wood”, “silk” or “to burn”, but is also used for negations (“no”,”not”) and as a marker at the end of a sentence in order to signalize a question. Sounds complicated? Guess what – it is. To get this straight: If you want to learn to speak Thai from scratch and “like a Thai”, your best option is surely to attend a professional language school here in Thailand and preferably take private lessons with a native Thai speaker. On the other hand, if your aim is just to learn some basic Thai so that you can communicate with Thai people in everyday situations, you may for now as well ignore the complicated tonal system. Speaking from our own experience, most Thais will understand you correctly from the context of your utterance anyway – even if you’ve used a wrong tone to pronounce a certain word. There are many regional dialects and varieties of standard Thai language, for example, the Lao-influenced version that your girlfriend from Udon Thani may speak, or the Khmer-influenced variety of her friend from Buriram near the Cambodian border. Both dialects will sound extremely different from the “Oxford-style” standard Thai that news anchormen and actors speak on Thai television. The most apparent difference is the pronunciation of certain letters. To give an example, the Thai alphabet features a letter for the R-sound and also combinations of consonants, e.g., PL or KR, which are actually pretty common in written Thai. Other than an actor in a movie, though, the average Thai speaker tends to realize “R” as “L” at the beginning of a syllable, and he would simply omit it if the “R” followed another consonant as in KR. To give an example, the north-eastern province of “khoRaat” is usually pronounced as “khoLaat” by the locals, and “sawat-dee kRap” (“hello” for male speakers) is typically simplified to “sawat-dee k_ap”. Regardless of numerous regional dialects – like the Lao-influenced variety spoken in Isaan – standard Thai (including a standard Thai alphabet) is the kingdom’s official language and understood in all parts of the country. Then again, even in standard Thai, things aren’t always what they seem with regard to pronunciation. Other than in Western languages, where each letter stands exclusively for a particular phonetic realization, some consonants in the Thai alphabet have two official phonetic realizations – one if it appears at the beginning of a syllable, and an alternative one if it appears at the ending of a syllable. For example, “CH” = CH/T; “F” = F/P; “J” = J/T; “L” = L/N; “R” = R/N; “S” = S/T. In other words, the Thai letter “S” is realized as “S” only at the beginning of a syllable, but as “T” at the end of a word. This weird feature of Thai letters often has an irritating effect on the English transcription of Thai words or names. Two prominent examples are the name of the Thai king – Bhumibol Adulyadej – which is correctly pronounced “PoomipoN AdooNyadet”, or the eastern province of Chonburi where Pattaya is located. 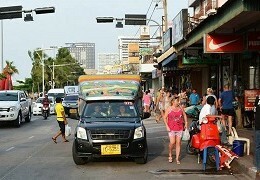 If you’ve been here before you may have noticed that Chonburi is sometimes written as “Cholburi” on street signs. 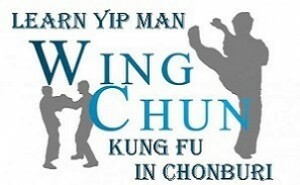 The reason is that in the original Thai writing, “choN” is actually written “choL”, with the Thai letter for “L”. But as the “L” appears at the end of the syllable, “choL” is correctly pronounced “choN”; hence, “choNburi” is the more suitable transcription. 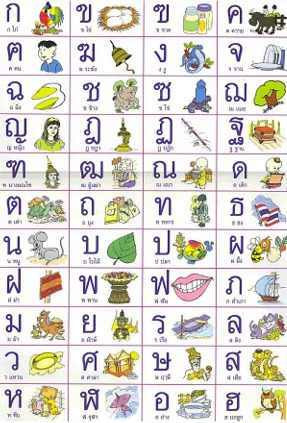 Thai has several registers and various levels of speech, for example, “slang”, “standard”, “polite” and “very polite”. By selecting a certain vocabulary, a Thai speaker indicates his self-perception and rating of his dialogue partner. Accordingly, special vocabulary is also being used when addressing Buddhist monks, or when talking about (or with) members of the royal family. On a polite speech level (which is recommended to foreign speakers), male and female speakers use different personal pronouns. The two frequently used particles “krab” (for male speakers) and “kha” (for female speakers) are actually relatively meaningless and, when used on their own, could be roughly translated as “yes”. When they’re used at the ending of a phrase, though, “krab” and “kha” indicate a polite speech level and signalize respect for the interlocutor. The Thai tonal system which, in order to learn it correctly, needs intensive listening and speaking practice, will also be ignored here. The very basics of Thai grammar, however, are easy enough for a short description. Please scroll down for a basic introduction to the grammar and syntax of this fascinating language. On a most fundamental level, Thai grammar is extremely simple, especially in comparison with more “complicated” European languages like French or German. For example, verbs do not inflect in Thai, but each lexical unit (or word) always stays the same. There is no declination either, no plural forms of nouns and no conjugation of verbs. Moreover, no distinctive verb forms are being used in order to signalize past tense, present, and future. Whereas in English, for example, the verb “to have”, depending on the speaker, time etc. is modified each time it’s being used in a different context (I have, she has, we had etc. ), the equivalent Thai verb mee (“to have”) always stays mee, regardless of which context it is being used in. There is no morphological distinction between classes of words such as nouns, verbs, adjectives or adverbs. Instead of different word classes, certain combinations of words define the current usage of a word. For example, by simply doubling the adjective reo (“quick”) it becomes the corresponding adverb (reo reo = “quickly”). Likewise, the prefix kwaam in front of an adjective turns it into a noun (e.g. kwaam reo = “speed”). There are no articles in Thai language either, and much less prepositions are being used. Basic Thai syntax is also incredibly simple. Each sentence is fundamentally structured by a so-called S-P-O pattern, i.e. subject – predicate – object. Questions and negations are signalized by adding meaningful particles to a sentence, however without destroying its basic structure. Also, if the meaning of an utterance isn’t diminished, both subject and predicate may be omitted as well. For example, personal pronouns that refer to a first- or second-person speaker, or subjects/objects that have been mentioned already, can simply be omitted without diminishing the meaning of a sentence. As words do not inflect in Thai, and the fundamental structure of a sentence is always a simple S-P-O pattern, it’s also very easy just to learn a couple of words and immediately start building some own phrases and sentences. This basic simplicity of its grammar, however, does not mean that Thai is a “primitive” or somehow less precise language than its more “complicated” Western counterparts. As mentioned above, in Thai language every sentence is fundamentally structured by an S-P-O pattern: subject – predicate – object. 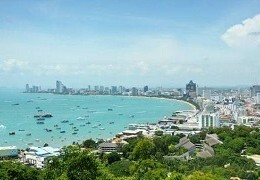 For example, pom bpai pattaya = I go (to) Pattaya. Negation is expressed by simply placing the word mai (with falling tone) in front of the verb: pom mai bpai pattaya = I do not go to Pattaya. Questions can be signalized by adding the word mai (with a rising tone) at the end of a sentence. For example, khun bpai pattaya = You go to Pattaya. On the other hand, khun bpai pattaya mai? = Do you go to Pattaya? khun bpai pattaya rue bplao? = Do you go to Pattaya (or not)? khun kin khao (laew) rue yang? = Have you already eaten (or not yet)? The correct Yes-answer in this case would be kin laew = (I have) eat(en) already. The correct No-answer would be yang mai kin or simply yang = not yet. Subject and object (or either of them) can be omitted in certain cases when the reference is obvious. Question: khun bpai pattaya mai? Answer: (pom) mai bpai (pattaya) = (I do) not go (to Pattaya). mai bpai (“not go”) is fully sufficient as as answer in this case. The same rule applies when a first-person speaker makes a reference to him/herself or addresses a conversational partner. For example, when uttered by a first person speaker, hiu khao has the same meaning as pom/chan hiu khao = I am hungry. Accordingly, the phrase hiu khao mai? has the same meaning as khun hiu khao mai? = Are you hungry? hiu (krab) instead of pom hiu khao would be fully sufficient as an answer and could be translated as “yes”. Question words (e.g. 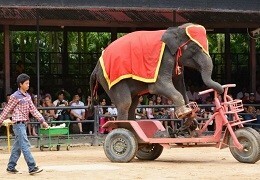 tam-mai = why) are generally placed in front of the S-P-O structure. For example: tam-mai khun hiu khao = Why are you hungry? The only exception is arai = what. Other than in English and most Western European languages, no equivalent of “to be” is required to link nouns and adjectives, i.e., adjectives immediately follow a noun. Comparative forms are built with the particle kwaa which is placed behind the adjective; for example, suai kwaa = more beautiful (than). Superlative forms are built with tee soot; for example, suai tee soot = most beautiful. The “too-form” of an adjective is indicated by the particles koe:n bpai which also follow the adjective. For example, paeng = expensive, paeng koe:n bpai = too expensive. Adverbs can be easily created by simply doubling the respective adjective. For example, reo = quick, reo reo = quickly. Or chaa = slow, chaa chaa = slowly. As exemplified by the sentence poo ying tai suai, the Thai equivalent of “to be” (bpen) must be omitted when an adjective is used to describe a noun, however not if another noun is used to further describe a subject. It is: somsak bpen khon tai = “Somsak is a Thai”, but poo ying tai suai. poo ying tai bpen suai would be incorrect Thai. Basically, no plural forms of nouns exist in Thai language. poo ying can mean both “woman” and “women”. Unless the context clarifies the usage of a word, or to make a more precise statement, so-called classifiers must however be used following the noun. In total, Thai has 12 different classifiers for different classes of nouns. For example, khon is the classifier for human beings. If you want to say “three women”, for example, you must place the classifier (khon) behind the noun and the number word (saam = “three”) in between the noun and its classifier. The correct result is poo ying saam khon = “three women” (literally “women three people”). saam poo ying would be wrong. In a few exceptional cases, plural forms can be created by simply doubling the respective noun; for example, dek = child, dek dek = children. Genitive forms are expressed with kho:ng which roughly translates as “of”. For example, baan kho:ng pom (“house of me”) has the meaning “my house.” [o:] signalizes a “long” O-sound as in English “morning”. In spoken Thai, kho:ng can also be omitted if the meaning is sufficiently clear. For example, baan pom (“house I/me”) has the same meaning as baan kho:ng pom (“my house”). Verbs do not inflect in Thai to indicate tense. Distinctive levels of past tense, present and future can however be clarified by adding certain adverbs and conjunctions. In general, no additional adverbs or conjunctions are needed to express an action taking place in the present. However, the adverb kamlang, placed between subject and predicate, signalizes an action that is currently going on and can be compared to the “present continuous” in English. Dtorn nee, diao nee and khana nee have a similar meaning as “now” and emphasize that an action takes place “now”. For example: diao nee pom kin khao = I eat now. bpat-joo-ban nee pattaya bpen mueang yai = nowadays Pattaya is a big city. wee-laa (speak “way-laa”), dtorn tee and khana tee are temporal conjunctions with a similar meaning as “when”. For example, wee-laa pom yoo pattaya pom wai naam took wan = When I stay in Pattaya I swim every day. ja (or cha, with a short a-sound) signalizes an action that is going to take place in the future and has the same function as “to be going to” or “will” in English. proong nee pom ja bpai pattaya = Tomorrow I will go to Pattaya. The conjunction diao … ja, placed around the subject, signalizes an action that will happen in the immediate future. For example, diao pom ja kin khao = I am going to eat (right now). The conjunction eek … ja adds a precise time information to an action that is going to happen in the future. 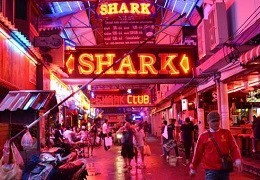 For example, eek saam bpee pom ja bpai pattaya = In three years I will visit (go to) Pattaya. There are no distinctive verb forms in Thai to signalize that an action has taken place in the past. Past tense can however be expressed by adding certain adverbs and conjunctions. pom phoeng maa tueng pattaya = I have just arrived in Pattaya. muea korn indicates a previous state and can be translated as “before”, “previously”, or “in the past”. For example, muea korn pattaya bpen mueang lek = In the past, Pattaya was (used to be) a small town. wee-laa pom yoo pattaya pom wai naam took wan = When I stay in Pattaya I swim every day. 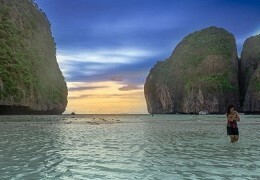 taa pom bpai pattaya pom (ja) wai naam took wan = If I go to Pattaya, I (will) swim every day. This is an excellent short intro to Thai grammar. It nicely sums up all of the most important and useful details.